Chapter 8. Problem or Resource? "A very important book that is more timely than ever." "Richly informative. ... A valuable discussion of the United States' past and present difficulties with intolerance and discrimination against immigrants." "A mature, insightful, highly readable work that is impressive in both its depth and scope. ... Even as he laments the absence of a Carl Sagan of linguistics to inspire a more lofty public debate, Crawford's ongoing work has made a major contribution toward filling the void." "Convincingly argues that multilingualism is a significant economic resource and that English Only sends a xenophobic message to the rest of the world." Hold Your Tongue. Rich in anecdotes, majestic in its sweep and scope. 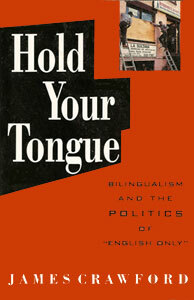 ... A ground-breaking study of the English Only movement."